Much of modern limnological study revolves around the primary productivity of lakes. The ecology of plant growth is of great importance to the character and history of lakes and to all other organisms that live in lakes. The major threat to lakes involves the excessive growth of primary producers due to nutrient inputs caused by poor landuse management. Therefore, it is worth a closer look at these organisms. 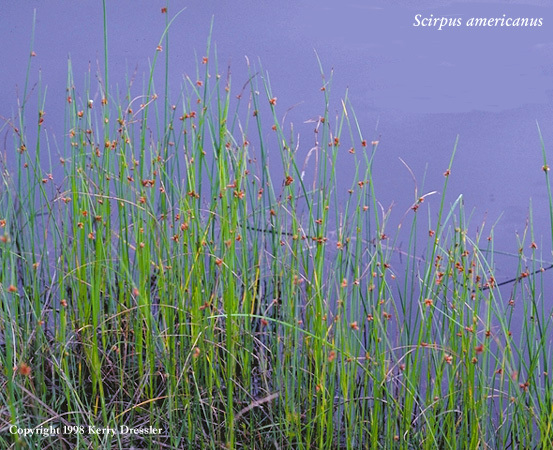 The littoral zone is defined by the growth of rooted and floating aquatic plants, or macrophytes. 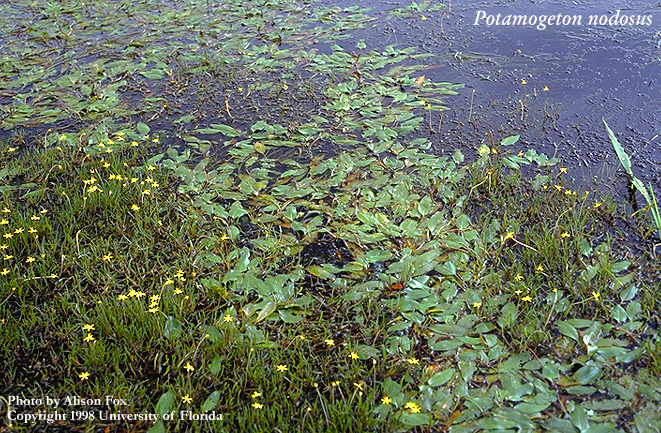 Figure 17 provides examples of common macrophytes found in Minnesota lakes. 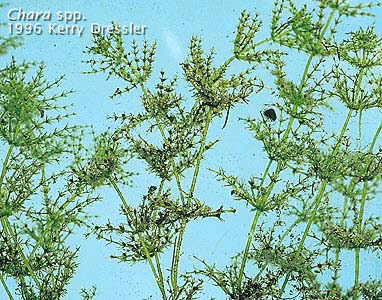 The macrophyte community can also include large algae, such as Chara,Nitelle,orCladophora.In shallow, clear lakes, macrophytes may represent most of the green plant material present and may account for most of the photosynthesis. 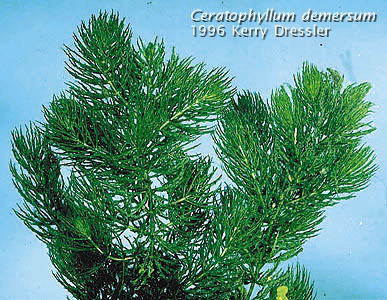 There may be few macrophytes in a lake when the bottom is too rocky or too sandy for the plants to anchor themselves, wave action too severe, or the water too deep. Also, sunlight may not reach the bottom even in shallow areas if the concentration of algae or silt is high. Image Archive and Cyanosite (Purdue University). Phytoplankton are classified into groups by the type of pigments they use to perform photosynthesis. While chlorophyll-a is common to all groups there are many other accessory pigments that allow the algae to capture different types of light. 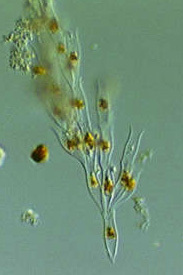 Green algae are considered the most closely related to higher plants. Within this group alone there is a great diversity of size, shape, and growth form (single celled, colonial, filamentous, and flagellated). Diatoms belong to a large group, classified as the golden-brown algae, which also includes chrysophytes and dinoflagellates. The most striking characteristic of diatoms and chrysophytes is the ability to form silica (glass) cell walls. 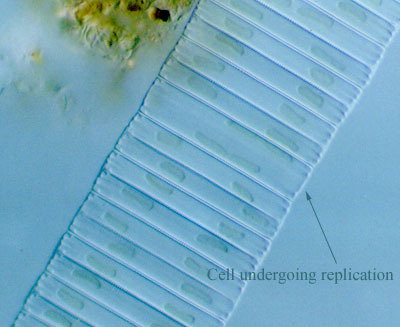 Diatoms cell walls are similar to a petri dish, having two halves that fit together. Some chrysophytes have elaborate silica scales, spines, or vase-like shells called loricas. Diatoms are non-motile (unable to swim), so they depend on water turbulence to remain suspended. 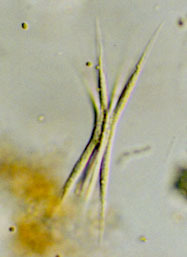 Chrysophytes have flagella (whip-like appendages) that allow them to control their position in the water column. 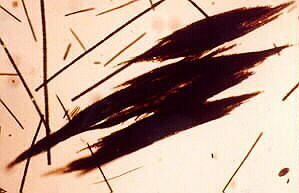 There are other important algal groups containing motile forms. 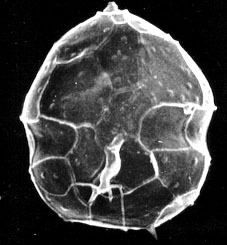 Dinoflagellates are another group of golden-brown algae that also have flagella. These cells are capable of moving very rapidly; positioning themselves where light and nutrients are optimal for growth. 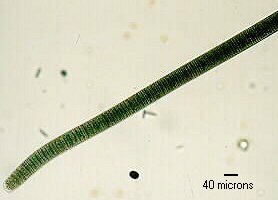 Another flagellated group called the cryptomonads are very small algae and contain pigments that enable them to photosynthesize under very low light conditions, either very deep in the water column or during those times of the year when sunlight isnt very strong. Blue-green "algae" are technically referred to as cyanobacteria since, except for their chlorophyll-based photosynthesis, they are bacteria. 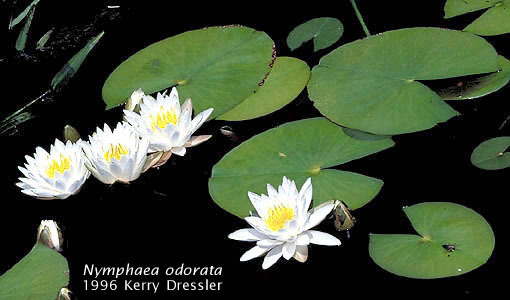 They generally receive the greatest amount of research and management attention because of their ability to form nuisance blooms in eutrophic lakes. It is important to remember, however, that blue-green algae are very important primary producers in both freshwater and marine systems, despite often being a nuisance. 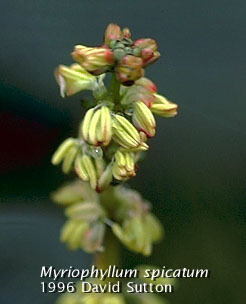 Blue-greens have several characteristics that often enable them to dominate and create nuisance or noxious conditions. Some blue-green species have the ability to adjust their buoyancy. They can float or sink depending on light conditions and nutrient supply. 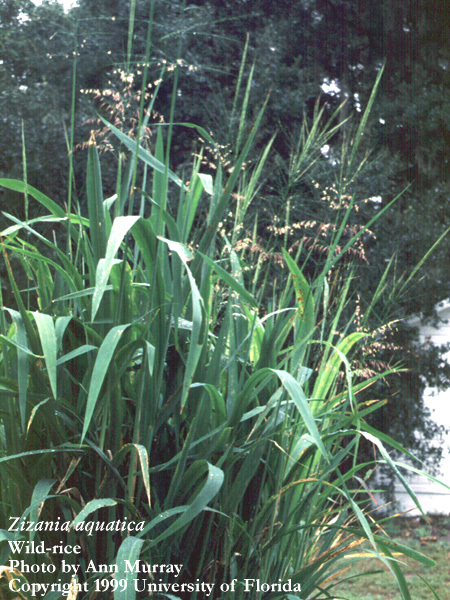 All plants, including all algae, typically satisfy their nitrogen requirement by absorbing nitrate (NO3-) and/or ammonium (NH4+) from the water. However, some blue-greens can fix molecular nitrogen (N2) derived from the atmosphere and dissolved in the water and convert it to ammonium in the cell through a process called nitrogen fixation. This allows them to maintain high rates of growth when other forms of nitrogen are sufficiently depleted to limit growth by other types of algae. Blue-green algae typically are well-adapted to phosphorus deficiency because of their ability to absorb and store excess phosphorus when it is available -- enough to last days to weeks in some cases. Unlike the green algae and diatoms, the blue-green algae are less suitable food for primary consumers. This is partly because some blue-greens can form large colonies of cells embedded in a gelatinous matrix which may pose handling problems for grazers. They also may produce chemicals that inhibit grazers or makes them "taste bad" to the grazers. Consequently, blue-greens have advantages over other algae at using nutrient and light resources, as well as avoiding being eaten. 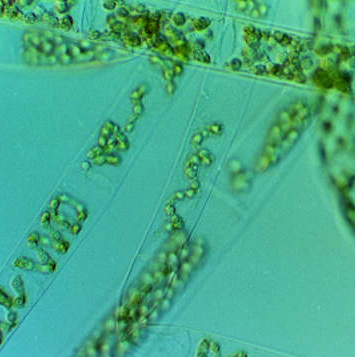 Aphanizomenon flos-aquae is a common species of filamentous blue-green algae (see Figure 18) with the ability to regulate its buoyancy, fix nitrogen, form large inedible colonies, and form algal blooms. 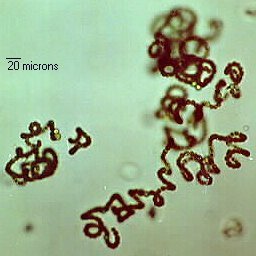 Other common bloom genera are Anabaena (N2-fixing filamentous algae) and Microcystis (colonial; not a N2-fixer). These bloom-forming algae are known to produce toxins in farm ponds that can poison cattle and, more recently, have been found to produce potent neurotoxins and hepatotoxins that may be a greater public health concern than previously realized.